Looking at album covers, one always gets an idea of how a band see themselves. For Sektor, those craggy mountains, the puffs of cloud, the odd vortex in the background, and above all the hand-drawn style of it all show a determination not to be mistaken for anything too basic or generic. Likewise, naming an album Allegory is a surefire way to get the attention of sceptics, not least because metal tends to spare little time for pretentious hot air, not least in the thrash metal subgenre, where Sektor find themselves occupying the majority of their time. On the other hand, those clues are enough to warn the listener not to expect the expected, a message that the album confirms from the off with some distinctive music. To firstly address issues of style, these Germans never settle down into one easy pigeonhole, the guitars especially morphing into odd icy shapes that suggest at least as much familiarity with black and death metal as anything from the Slayer side of the tracks. For instance, there are plenty of deathly beats exhibited on the likes of “The Teachings of AOS”, ploughing ahead with double kick action that wouldn’t displease Deicide fans if the more nostalgic tremolo riffing and modern lead wizardry prove palatable. This kind of genre-mashing borrows enough from both the old and the new school of extreme metal to cater to either side of the divide, the rattle of the drums and the throaty roars getting their cutting edge from the trebly guitars that slice through the mix with a melodic sparkle and piercing clarity when the slow shred comes out at the beginning of “Hypnotic Afflatus”. 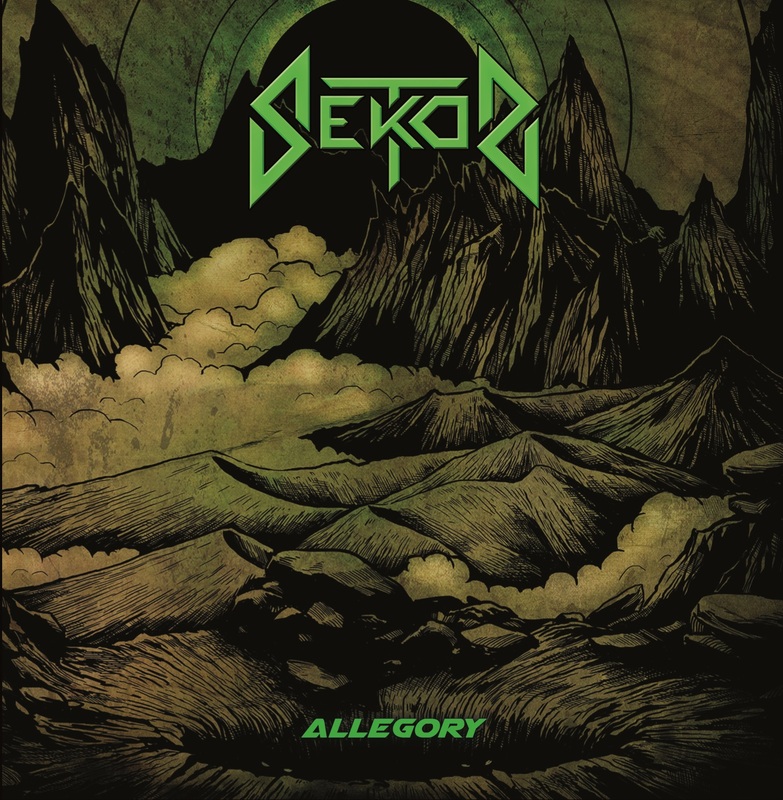 A distinctive factor in the mixture is Sektor’s use of clean guitars to make a chilly and misty atmosphere at several moments during the album. The mid-section of “Confession in Despair” gives Thomas Hagl a few moments to rest when his drums drop out and echoey cleans enter in a kind of acid Spanish style, switching moods suddenly with broken chords to build up an unusual feeling. This alien feeling returns frequently throughout the album, slow crawling riffs finishing the title track with more questions than it answers, while the bass booms out in alternate endings that also carry an air of mystery. This exploration of atmosphere, in conjunction with the technical touches of the guitar playing, makes Allegory a fairly knotty listen despite a brief 33 minute running time and only seven full songs, the structures twisting themselves into progressive and linear forms that will keep the listener guessing well past the fourth or fifth listen. For all that the atmosphere is a powerful part of the band’s appeal, it doesn’t prevent the riffs and pure heaviness satisfying of its own accord. Some of the heads down moments are vicious, such as the icy tremolo riffing midway through “The Process of Projecting the Conscious into One Part” or the forceful death thrash thrust of “Die Blumen Des Bösen”, both of which will provide plenty of exercise for the neck and throat. Most of the riffs are as creative as the structures, meaning that one can’t easily tell what kind of extra features a musical movement might contain, as when “Hypnotic Afflatus” supplements standard black thrash riffing with an almighty guitar fill, best witnessed at 2:05. The leads are definitely a worthy part of the album too, though these are perhaps even less formulaic than the riffs, following a path mildly similar to early Entombed – though with James Murphy’s chops – by appearing at unexpected moments and rarely playing at the same quick pace as the rest of the band. If any complaints are to be made about Allegory, they are not serious. The first is on the subject of vocals, which are merely a modest achievement on the part of Patrick Dvoracsek, possessing too little power and an indistinct style that doesn’t allow the implications of the promised ‘allegory’ to come through except in a few moments where he chooses to narrate. Considering the challenging style that Sektor play, it might also have been nice to see slightly more development of the great ideas in the album, since there are some fleeting moments of excellent playing and creative construction that feel rather nonchalantly placed into songs, whereas they could have been more deliberately positioned and emphasized. In a similar vein, the absence of many hooks leaves Allegory rather resilient to penetration, though the melodic features of the release go some way to making it accessible. Therefore, Sektor’s second full-length comes with a high recommendation, though also a word of caution to allow its intriguing character to sink in slowly. Anyone who can’t wait should get their ears round “Hypnotic Afflatus” and “The Process of Projecting the Consciousness into One Part” first, then take the rest of the album as it comes. This entry was posted in Black Metal, Death Metal, Progressive Metal, Reviews, Thrash Metal and tagged 2017, allegory, black metal, Death Metal, Deicide, Entombed, German, germany, James Murphy, progressive, sektor, Slayer, Thrash. Edmund doesn't know where he lives anymore. Born in England, attended university in Wales, and currently living in China, he has realized that where the head is, home is. His head is filled with heavy metal and wry thoughts.